BOSTON – The Boston Planning & Development Agency (BPDA) and the Department of Neighborhood Development (DND) today announced that the 226 – 232 Highland Street E+ Green Building project in Roxbury has been selected as a 2017 American Institute of Architects (AIA) Housing Award Winner, one of three across the country in the “One and Two Family Production Home” category. The development is part of the City of Boston’s E+ Green Building Program, which is managed jointly by the BPDA, DND, and the City of Boston Environment Department. The architect and developer, ISA / Interface Studio Architects and Urbanica, were selected through a competitive design competition announced by Mayor Walsh last year. 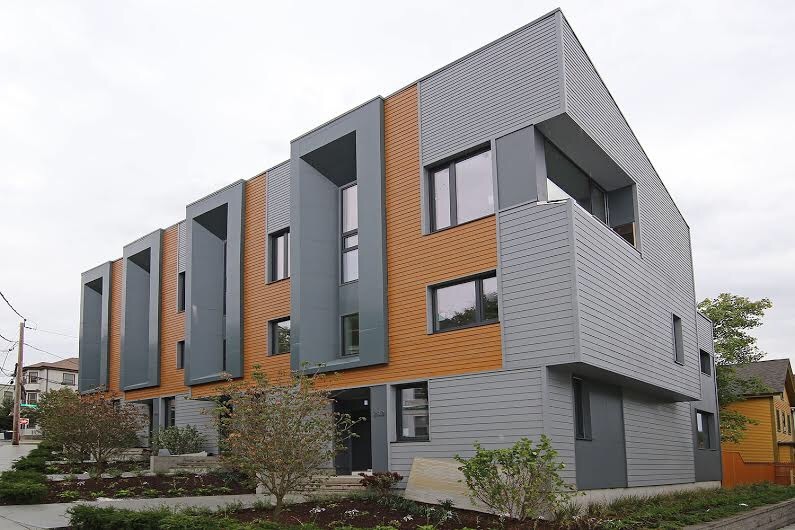 The four wood-frame townhomes, located at the corner of Highland and Marcella Streets in Roxbury, produce more energy than they consume in a year. The homes are also certified as LEED Platinum, the US Green Building Council’s highest recognition for sustainable design. All of the townhomes are energy efficient with highly insulated air-tight walls and windows, LED lights, solar panels and water efficient plumbing. The design features, which include energy recovery ventilation, ensure access to fresh air while allowing the homes to keep a consistent temperature throughout the year with minimal heating in the winter or cooling in the summer months. The AIA’s Housing Awards emphasize good housing as a necessity of life, a sanctuary for the human spirit, and a valuable national resource. Recipients show the world how beauty, safety, sustainability, and comfort can come together. Piloting new practices like these E+ Green Buildings that are net-positive reflects some of the strategies outlined in the City’s Updated 2014 Climate Action Plan for reducing Boston’s greenhouse gas emissions by 25 percent by 2020 and for achieving the goal of carbon neutrality by 2050. With buildings contributing almost three quarters of Boston’s greenhouse gas emissions, Boston’s E+ Green Buildings significantly reduce emissions and pioneer the practices that will enable us to achieve our goals. Boston will continue to pilot net-positive building practices with new and expanded E+ Green Building and E+ Green Communities offerings.